The killing of Indian head of Italian company Oerlikon Graziano Transmissioni Pvt Ltd on Monday has adversely affected the industrial climate in Noida and Greater Noida. Oerilkon Graziano international chief, Marcello Lamberto, who visited Graziano Transmissioni India Pvt Ltd’s factory in Greater Noida, also met with the family of Lalit Kishore Chaudhary, the lynched CEO and MD of the company. He also visited the injured company workers at Kailash Hospital in Greater Noida and assured them of all help for treatment. A Delhi-based entrepreneur was lucky to escape a kidnap attempt by some unknown youths last night on NH-8, as the car in which they were taking the victim met with an accident and they had to abandon it. In a bid to show solidarity with the rather shaken student community at Jamia Millia Islamia University, the vice-chancellor led a silent peace march through the university campus accompanied by over 5,000 students and faculty. The march began this morning at the faculty of engineering and wound up at the administrative building. Safdar Hashmi Memorial Trust (SAHMAT) has applauded vice-chancellor of Jamia Millia Islamia Mushirul Hasan and its staff and students for their calmness and courage in dealing with the aftermath of the shootout that took place on October 19 at Batla House in Jamia Nagar. The Centre of Indian languages, Jawaharlal Nehru University (JNU) paid tributes to the prominent Hindi writer Prabha Khaitan. In a raid conducted by the Reserve Bank of India in the Kavi Nagar, Ghaziabad branch of Oriental Bank of Commerce, Rs 1.43 lakh in fake currency have been recovered. With the arrest of a couple — Eric Anthony William Massey and Liza (name changed), the Dwarka police has claimed to have solved more than four cases of murder and robbery. A man was shot dead at point blank range here on Tuesday night. A man was robbed of his car, cash, jewellery and mobile phone while he was returning home to Ghaziabad early Wednesday, the police said. The police later recovered the car. The Delhi High Court on Wednesday ordered Blueline bus owners to pay interim compensation to victim’s family in case of an accident. BSES meter-testing labs at Savita Vihar and Pushp Vihar have received the internationally recognised and much sought-after ISO seal of approval from the National Accreditation Board for Testing and Calibration Laboratories (NABL), India’s sole laboratory accreditation authority and part of Department of Science and Technology, Government of India. The water level in the swollen Yamuna has started receding and it has now gone a few centimetres below the danger mark, but the situation continues to cause concern among the authorities here. Delhi unit of the Bharatiya Janata Party (BJP) has alleged that the Congress government in the city was making false promises in wake of the forthcoming assembly elections. The elections are scheduled to be held in November. Bharatiya Janata Party (BJP) Delhi pradesh president Harsh Vardhan has expressed concern over the rising prices of vegetables, including tomatoes, and claimed that this was the handiwork of hoarders in connivance with some corrupt Delhi government officials. Journalist and author, Anita Jain, was in the Capital recently to promote her book, ‘Marrying Anita,’ written tongue-in-cheek by the author, portraying a woman’s journey to find her soul mate, her husband. The American Indian journalist, Anita Jain, is the woman who boldly traverses continents in her search for love. The unfortunate event seems to have put a further investment of Rs 1,500 crore of the Italian company in its Greater Noida unit into abeyance. The lynching of Chaudhary has not only raised questions about the future of the company in India, but has also made other companies operating from Greater Noida concerned about their safety. Established in 1998, Graziano Transmissioni India Pvt Ltd is a 100 per cent subsidiary of Italy-based US $ 6 billion Oerlikon Graziano group. The Greater Noida plant was built with Rs 150 crore and the group had planned to invest Rs 30 crore more in the plant this year and Rs 100 crore over the next three years. This unit manufactures automobile parts and has an annual turnover of Rs 360 crore. “We are facing similar problems. The Graziano incident has provoked our workers, who have started creating disturbances since last evening. I have requested the police for security,” said D.K. Yadav, HR head, Stallion Company. Meanwhile, SSP R.K. Chaturvedi said that while a DSP has been appointed to take care of industrial units, SO of the concerned police station had been suspended, while additional SP (rural) Babu Ram and Dadri DSP R.K. Gautam had been transferred. He requested the doctors at Kailash Hospital to provide the best possible treatment to injured company workers. He said that the Italian company would not relocate from India. The company bosses were not in a mood to take any hasty step. The company’s world head (operations) went around the factory to assess the damage to it. The district administration has meanwhile created a separate post of dy superintendent of police (Industries) to look after the law and order in the industrial belt of the district. Marcello said the company was analyzing and assessing the situation from all possible angles, and only after this assessment, some decision would be taken.The world head of the company refused to comment on Union labour minister Oscar Fernandes’ statement on the issue. He had some encouraging words for the demoralized company staff and workers. He urged them to get back to their work. The company management will stand by them through thick and thin, Marcello assured them. The company member-director R.C. Jain of Graziano condemned the violence in company on Monday. The vice-president of Indian Industries Association Jatinder Parikh and president of Greater Noida Industries Association, Sehdev Sharma also condemned the statement of Union labour minister Oscar Fernandes. Meanwhile SSP R.K. Chaturvedi informs that a special cell has been set up under newly appointed DSP (Industries). This cell will consist of 24 teams to improve security in industrial belt. SSP said the killers of L.K. Chaudhary would be identified by September 30. Interestingly, the documents of the said Maruti 800 (DL 4CG 0932) car showed that it belonged to one Paramjit of Vikaspuri, Delhi. But when the Gurgaon police reached at the address, it found no person of this name living there. This indicated that this car being used by the alleged kidnappers could be a stolen one. The investigation in this regard is on. As per DCP (South) Inder Singh Saini, some unidentified youths on a motorcycle and the said Maruti car stopped Navin Kapur of Patparganj, Delhi near Nakhdaula village on NH-8. The accused beat up Kapur and drove away his Honda City (DL 3C A 1005) along with him towards Jaipur. They snatched Rs 16,000 as well as mobile phone from him. But their Maruti car met with an accident near Rampura village. Subsequently, they abandoned it as well as Kapur and his car before escaping from the spot. Kapur somehow reached Manesar police station and reported the matter. But a case was registered at Kherki Daula police station as the incident took place under its jurisdiction. Silence prevailed as no speeches were made and no slogans were raised. A few students carried handmade posters making a call for peace and an end to violence. University officials inform that the peace march was meant to instil confidence and solidarity among the Jamia fraternity and reiterate the university’s insistence on maintaining calm and order. The procession dispersed just before noon with most students going back to their classes. Shortly after the peace march, some 20 activists from the Akhil Bhartiya Vidyarthi Parishad entered the campus, shouting slogans against the vice-chancellor, Prof Mushirul Hasan and demanding his ouster. They were carrying an effigy of Prof Hasan which they intended to burn on the Jamia campus. The university’s proctor informed that the local police immediately arrived on the scene and stopped the burning of the effigy. Meanwhile, the executive council and the academic council of Jamia Millia Islamia has expressed its support to the vice-chancellor, Prof Mushirul Hasan, for the handling of the recent crisis in the university. An extraordinary meeting of the Academic Council (AC) was held on Thursday morning and an emergent meeting of the EC was held in the afternoon. The 125-member academic council has decided to form its own committee to raise funds for the detained students and provide relief to them. The AC endorsed the stand taken by the vice-chancellor for providing legal assistance to the Jamia students detained by the police. Further, it deliberated at length upon the recent crisis in the locality and its repercussions on campus. The AC unanimously expressed deep concern over the continuing detention of Jamia students in police custody in connection with their alleged involvement in terrorist activities. The house agreed to following points: that the incidents of alleged terrorism are in no way connected to the university, that it is outrageous to castigate an 80-year old university on the basis of unproved charges against a couple of students. 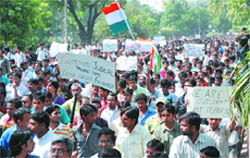 Under these circumstances, Jamia should defend its constitutional, legal and moral rights while preserving its liberal secular character; the university has also decided to form two committees to provide relief to the Jamia students; and is prepared to request the government to set up a judicial inquiry into the incidents in the locality adjacent to the university. The AC has also decided to form a legal aid committee and a student relief fund committee. It has also condemned the alleged vituperative attacks by the Bharatiya Janata Party and other Hindu bodies on Mushirul Hasan. Meanwhile, SAHMAT has appealed to all democratic and secular bodies to support the university administration in maintaining and strengthening the secular character of the institution. The centre organised a memorial meeting for Prabha Khaitan, who passed away recently in Kolkata. The sixty six-years-old Hindi author had written many novels, poetry collections, essays of social concern, philosophical writings and had also translated several classics in Hindi. Varyam Singh, dean of the School of Languages remembered Prabha for her bold feminist writings in Hindi. “Prabha Khaitan’s writings have contributed towards the development of powerful women writings in Hindi,” he said. Chaman Lal also recalled his meeting with the writer in Kolkata few years ago. Ranjit Saha, Nishant and Surabhi, faculty members, shared their perceptions of the departed author. The meeting concluded with one minute silence in her memory. A team from Kanpur branch of Reserve Bank of India had conducted a routine check of the currency chest of the Oriental Bank of Commerce from August 8 to September 9, it is learnt. The FIR has been lodged today only. A case against the branch manager of the Oriental Bank and 32 other bank employees was registered by the RBI in Kavi Nagar police station today. 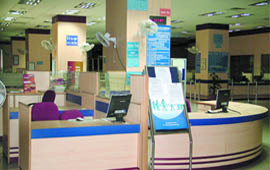 The currency chest of the Oriental Bank of Commerce is located in Kavi Nagar branch, though there are four other branches of the bank in Ghaziabad. According to sources, this consignment of fake Indian currency was supplied from some neighbouring countries. It is well known that a lot of fake currency, which is being circulated in Uttar Pradesh, has also found its way into some public sector banks. A few months ago, lakhs of fake notes were recovered from the branch of State Bank of India by the Kanpur branch of RBI. The flow of sizeable fake currency into UP market is being linked with terror organizations. It is believed that fake notes are being routed to terror organizations in the country via Nepal and Bangladesh. Pakistan’s ISI is believed to be engineering this network with a twin objective of weakening the Indian economy and funding the notorious terror machines. Some sources suspect that the ISI has set up special mints in Bangladesh to print Indian currency and flood Indian markets with it. According to the police, the two used to lure people through internet chatting. Liza enticed the victims for meeting, administered drugs in their beverage and robbed them of their valuables. A police official claimed that with their arrest the case in which the highly decomposed body of Mahesh Goel was found in the Dwarka area of the Capital was also solved. On July 15, the Liza fixed a meeting with the deceased at Metropolitan Mall in Gurgaon after chatting with him on a social networking site. Both Eric and Liza were present in the parking lot of the mall. Liza met Mahesh Goel in his car and offered him pastries laced with drugs. After consuming them, Mahesh fell unconscious. Meanwhile, Eric drove the car towards Gurgaon highway toll tax where they had planned to abandon it with Mahesh inside. But they did not find a suitable place due to dense traffic. Eventually, Mahesh regained consciousness and resisted while the two were searching his wallet. The accused repeatedly hit him on his head, as a result he died. The two picked up the victim’s belongings including laptop, credit card, photo identity card and brief case and fled away from the spot. Several credit cards and precious items were recovered from them. Bhim alias Babloo, 20, was passing through a lane on his cycle in Hazipur locality under Sector-39 police station here, when some people came in front of him and fired at him from a pistol. The incident occurred at 9 pm.After killing him, the assailants fled the spot. The incident took place at 1.30 am on Wednesday on the Link Road under Indirapuram police station in Ghaziabad. According to family sources, Rakesh Sharma, a resident of Judges Colony in Vaishali, was intercepted by four robbers on two motorcycles at the Mohan Nagar flyover.Sharma was overpowered and robbed of his mobile phone, cash, jewellery and his car. A bench comprising Chief Justice Ajit Prakash Shah and Justice S. Muralidhar ordered Blueline bus owners to pay Rs 100,000 as interim compensation to the victim’s family in case of fatal accident and Rs 50,000 to the one who suffered grievous injuries or permanent disability as the result of the mishap. The order will also be applicable on Delhi Transport Corporation (DTC) and state carriage buses. The bench viewed the interim scheme as a humanitarian move to provide sustenance in form of financial assistance to Blueline victims and their families. 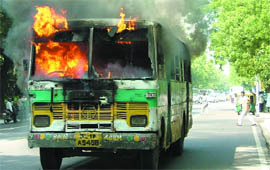 The case was heard after the Delhi High Court, in July 2007, took suo motu cognizance of the increasing number of fatalities involving Blueline buses. The bench said that the bus would immediately be impounded after such an accident and would be released by metropolitan magistrate only after the owner pays interim compensation to the victim’s family. The magistrate will take the deposit from the Blueline owner at the time of the release and hand over the compensation amount to the victim or the family. To receive the amount, the victim or his/her family will have to give a written undertaking in the court to file an accident claim case in the special tribunal for a final decree on the compensation. The amount given by the magistrate is only for immediate help to the victims — the final compensation will be given through the insurance claim on the vehicle as ordered by the tribunal. The amount provided as interim compensation will later be adjusted with the final amount of compensation as ordered by the special tribunal. The insurance company will reimburse the interim compensation given by the bus owner to him after the tribunal passes its final orders. By getting this coveted accreditation, BSES has joined the select league of some of the most respected names in India across industry and sectors. Some of them who have received the NABL accreditation for their labs and permitted to issue test reports/certificates with the famed NABL symbol include Bureau of Indian Standards (BIS); Electrical Research and Development Association (ERDA); Central Power Research Institute (CPRI); Bharat Heavy Electricals Limited (BHEL); Electricals Regional Test Laboratory (North), New Delhi, Central Forensic Laboratory, Hyderabad; Shriram Institute of Industrial Research, Bangalore; Apollo Hospitals, Chennai and Dr Lal Path Labs Pvt Limited. BSES meter-testing laboratories received the renowned ISO/IEC 17025: 2005 accreditation from NABL after a long process, involving stringent checks and audit of its meter-testing lab processes and procedures. The audit covered the entire gamut and all aspects of meter-testing. Meter-testing labs play a very crucial role in the power sector. Meters need to be periodically tested to ensure the quality of their accuracy. Till this accreditation, BSES was utilizing the services of CPRI and ERDA, said a BSES official. According to Arun Kanchan, CEO, BSES, “There are only a handful of distribution utilities in India that have NABL accreditation. This accreditation once again proves the quality of stringent world-class norms and benchmarks being followed at BSES. Officials of the Delhi government’s flood control department said the situation was being monitored continuously to prevent any untoward incident. The Railways had yesterday diverted and cancelled several trains because of the closure of the Old Yamuna Bridge. Officials said that it would take at least a week for the situation to return to normal. Meanwhile, all help was being provided to those who had to abandon their homes because of the floods in the low-lying areas along the banks of the river and were taking shelter in camps set up especially by the Delhi government. Several voluntary agencies have also become active and are providing assistance to the affected families. The water level of river Yamuna had crossed the danger mark last week after Haryana released more than three lakh cusecs of water from the Tajewala waterworks. In a press statement issued here today, the BJP said that stones for many projects were laid in a single day. “Before the 2003 elections, Chief Minister Sheila Dikshit had laid stone of Liver and Billiary Science Institute at Vasant Vihar. She had announced that the institute would be completed in a record time of two years. Even after five years, the construction work has not been completed,” said Delhi BJP president Harsh Vardhan. He added that 10 years ago when the BJP was in power, Rs 100 crore plan was framed for the reconstruction of LNJP Hospital. “But the reconstruction work is still pending. There is lack of emergency services and severe scarcity of instruments in the hospital,” he alleged. The saffron party further alleged that the Congress leadership was in hibernation for the past 10 years. And, now, as the elections are approaching, the party is making false announcements. In a statement issued here, the Delhi BJP president said that tomatoes were selling at the rate of Rs 15-20 per kg but now within a week they were selling at Rs 40-50 per kg. With the prices of pulses and milk already at an all time high, the inordinate increase in the prices of vegetables was burning a deep hole in the pockets of the consumers who were already reeling under unprecedented inflation. Harsh Vardhan claimed that within the past few days the price of brinjals has gone up to Rs 30-32 per kg, pumpkins Rs 25-28 per kg, ladyfingers Rs 40-45 per kg, Capcicum Rs 80-100 per kg, spinach Rs 25-30 per kg, cauliflower Rs 40-60 per kg, cabbage Rs 25-30 per kg, bittergourds Rs 25-28 per kg, beans Rs 90-100 per kg, tinda Rs 60-100 per kg, parwal Rs 28-30 per kg, cucumbers Rs 20-25 per kg, potatoes Rs 15-20 per kg and onions Rs 18-20 per kg. The Delhi pradesh BJP president urged the Delhi government to initiate immediate steps to check the prices of essential commodities so that the common man gets some relief. Journalist and author Nirpal Singh Dhaliwal, posed questions to Anita on the book during the release of the book at the American Center. Anita’s book has been well received in the US. It portrays a woman tired with life visiting dating sites on the net. She travels to her country of origin to find a mate. Anita looked chic at the release in a dark well-fitted dress as she spoke candidly on a book that mirrors her life. It is amazingly honest of Anita to account her own story, trials and joys in a way in which many can relate to her. Simultaneously, Anita stresses that the book is more than what the name suggests. The book is set in the backdrop of a rapidly modernizing India and lists Anita’s encounters both in the West and in the “new India” which is rapidly modernizing. It is a speedy and refreshing read. The author has thoughtfully examined the nature of human relationships, friendships, connectivity with strangers which at times can leave a major impact.